Can you believe that it has been 15 years since the NDC Association of Alumni and Friends (NDCAAF) was created? 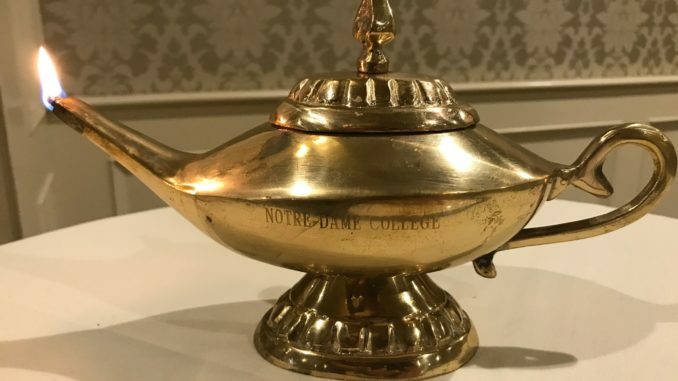 What a testament to the rich traditions and mission that Notre Dame College instilled in all of us — that wonderful sense of community! For the past 15 years, the NDCAAF has been able to accomplish many things through your help and support — and we’re extremely proud of those accomplishments. • We have held 15 annual reunions, allowing folks the chance to reminisce and reconnect. • Each reunion had a keynote speaker that highlighted the accomplishments of faculty, staff and alumni. • We acknowledged members of the Association on a rotating basis with three annual awards: Good and Faithful Servant, NDC Spirit, and Excellence in a Profession. • We initiated and were able to award an annual $200 scholarship to support the educational pursuits of alumni/friends and their family members. • We continued the spirit of community service at each reunion by collecting socks, food, and school supplies for organizations in the Manchester community. • We continued our support for the people of Haiti donating funds for mortar boards (graduation caps) and planting trees; and over the last 15 years we’ve had several alumni continue to volunteer at St. Francis Inn in Philadelphia. • We have gone back to Notre Dame College — 2321 Elm Street — during two reunion events, and we planted a tree there in 2013 in celebration of NDC alums. • We participated in the Sr. Pauline Relay for Life at St. Anselm’s College. • We coordinated a walk-a-thon for Make a Wish. • We created and sold a cookbook compiled of recipes from NDC alums and friends and donated the proceeds to Kids Cafe in Manchester, NH. • We created a new website and Facebook community to ensure that alumni and friends have a place to remain connected. • We volunteered to support the Sisters at their annual Holy Cross Fair. • We held a few alumni nights at the Manchester Monarchs hockey games. • We have outreached to families, offering support from the Association when key faculty and staff have passed away. • We partnered with Cafe Press to create an online store allowing NDC alums and friends to purchase NDC-themed merchandise. • We updated our logo with the help of NDC Alum member, Brad Wuorinen. • We have served as a way for people to stay connected, whether they are trying to find their transcripts or track down an old friend, offering a place for people to remain connected despite a lack of a physical campus. • We’re a 503C organization with solid by-laws and constitution, with several alumni and friends serving on the Board of Directors to guide our Association over the years. As you can see, we have a lot to celebrate and be proud of. As with any organization that has been around for this long, it is necessary to make sure that we are still meeting the needs of our members. The Board of Directors has decided to take the next year to reevaluate the Association to assess what we are providing for our members and determine what we should work on for the future. Therefore, we will not be holding a reunion in 2018 as we will be using this time to work on our evaluation and updates. We’ve appreciated the support from those alumni and friends who have attended reunions over the years and know many of you look forward to opportunity to reconnect with the NDC family. We ask for your patience with us as we review the Association in order to better meet your needs. We will be communicating with you through several surveys to gather your thoughts and opinions on how you’d like to see the Association move forward. Please take the time to offer us your candid feedback because we will be using this during our evaluation process. We hope to hear from as many of you as possible to make sure that we are representing the needs of our diverse community who have been a part of NDC since 1950. As always, thank you for your support of the Notre Dame College Association of Alumni and Friends. Please Take Our Reunion Survey!